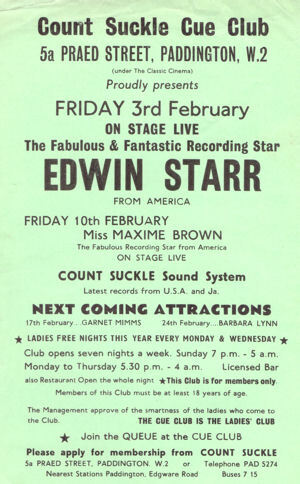 The club was open seven nights a week it had a licensed bar and a restaurant; also live acts appearing mainly at the weekends. which were just about every top act and band from Jamaica and the USA. Prince Buster, Don Drummond, Tommy McCook, Roland Alphonso, The Skatalites, Bob Marley, Joyce Bond, Marvin Gaye, Tina Turner, Stevie Wonder, Edwin Starr, Maxime Brown, Billy Stewart, Garnet Mimms and Jimmy McGriff all played there over the years. 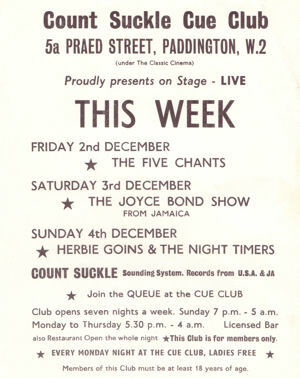 The club was for members only and became a favourite of the smart young Mods who attended the allnight sessions and mixed with black Londoners to hear the latest Ska and Soul Music. Count Suckle had a massive and exclusive record collection built up over many years. Due to the club's success it was not long before Count Suckle could be seen driving his cream Corniche Rolls-Royce around the streets of London. 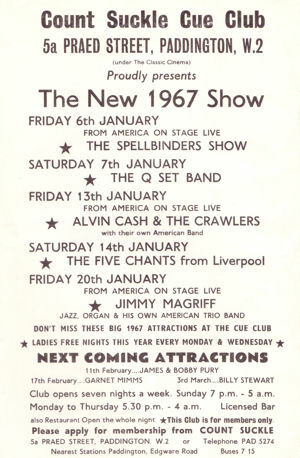 The club changed it name to the Q Club and continued on through the Seventies. Another name change in 1981 was to the People's Club and finally it closed in 1986. In May 2014 he died of a heart attack. He was 82 years old. He is survived by his partner Rosetta Whyte, two sons and a daughter. In 2008 Count Suckle took part in the documentary, Duke Vin, Count Suckle and the Birth of Ska, directed by Gus Berger, which acknowledged his contribution to British popular music and dance culture.